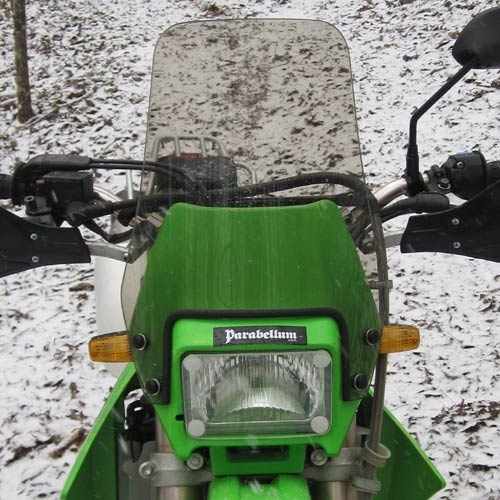 The Parabellum Rally shield for the 2006-2007 Kawasaki KLX250S is an upright rally type windshield inspired by past and present Dakar race bikes. The Rally shield looks aggressive and performs well under all types of riding although designed primarily for offroad/dualsporting adventures. On the street this rally screen keeps unwanted air pressure off the rider’s chest while still allowing your head to be in clean undisturbed air. 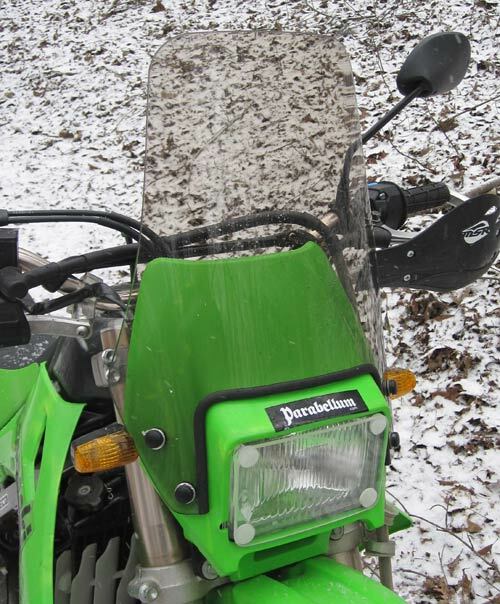 Offroad, the rally shield protects riders from roost, rocks, briar patches, mountain laurel thickets and low lying branches one may encounter on the trail. This rally windscreen is perfect for those seeking protection without losing any technical riding capabilities. Duck behind it in the rain/snow or going through thick brush. Mount your GPS behind it for easy viewing while keeping it protected. This shield mounts simply to the stock headlight shroud using minimal hardware to keep weight down. The Rally Windshield measures 12.5 inches tall, 11.5 inches wide at the bottom, and 8.5 inches wide at the top. Made from 1/8 inch acrylic and offered in clear or tint. Note: Please specify model and year in item message box above to keep your order from being delayed. We will need to confirm it with you, if omitted. Copyright © 1997-2014 Parabellum Ltd. All rights reserved.